.NET is a Framework from Microsoft, introduced in 2001 that makes it easier to build applications that cross platforms and hardware. It does this by providing a consistent and powerful set of classes and interfaces that abstract away differences of architecture and allow developers to use the right languages and tools that work for them. A large base class library that includes features such as data and file access, user interface features, cryptography and more, opens up the power of the Windows operating system. The applications are run in a safe runtime engine called the CLR, which handles security, memory management, exception handling and more. 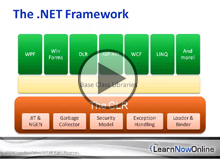 In this course we will take a look at how the .NET framework is built and what you need to know to make the most of it.